Being creative with art and craft ideas isn’t just about taking raw materials, such as fabrics and cards, to turn them into something new. It can also be about taking existing objects which may seem dull and boring and turn them into an object or device that is extremely useful and fun. Clothespins fall into this category and are something that we may often see as dull and boring, but are in fact very useful and can be used for a wide range of different things. We’ve found an intriguing collection of ideas that can give you inspiration to look at and use clothespins in different way. Although clothespins do the job of hanging up clothes outside so that they can dry, they can also be used for over 20 other different, useful, and fun things. Some of the ideas are perfect for kids while others are great for all ages. Clothespins are therefore ideal for a wide range of things and will appeal to many different individuals. For example, you could use your clothespins to hold business cards on your desk so that you do not forget about those important contacts. Or you could use the clothespins to keep electrical wires attached together and organized. You could use a clothespin to create a single peg in the inside of your bag and attach an important item. 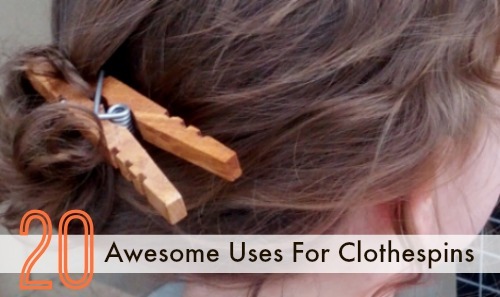 There are also ways in which you can make the clothespins look nice, too. One can easily paint them and make them look more stylish. Although the list isn’t endless, it is definitely plentiful and innovative. With a different frame of mind, you can begin to see that the pegs that once seemed to be only usable to hang clothes on a line are far more versatile and can be used in at least twenty different situations to make life easier.